Location. 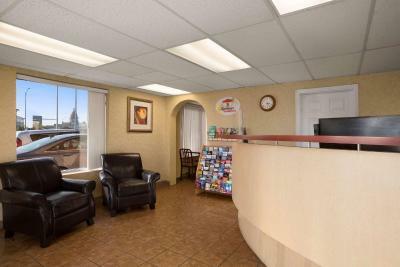 Close to Downtown and car rentals . Freindly staff and reasonable breakfast with coffe available all day. Although we arrived earlier than the checking time(arrived around 10am), the hotel also provide the free parking. 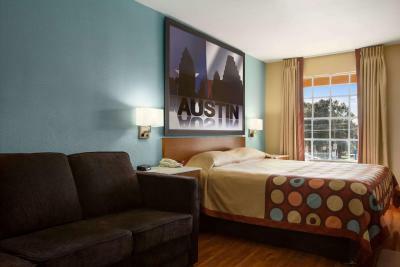 Since the hotel's location is close to downtown Austin(about 15 mins walk), it is really convenient for the visitors who want to tour around Austin but also save the parking fee. The room was very clean and comfortable. Overall great value for the money. The location was ok. It was a 10 minutes walk to 6th Street where the music scene is as well as a 10 minutes walk to the State Capitol. Austin is a city with many homeless people and you cannot avoid them. Even in better much more expensive hotels you meet them everywhere. Location is good. Convenient as there is a bus that takes me downtown. Many eateries nearby. Nothing to look at from the outside but the room was very clean, roomy and had everything you need. 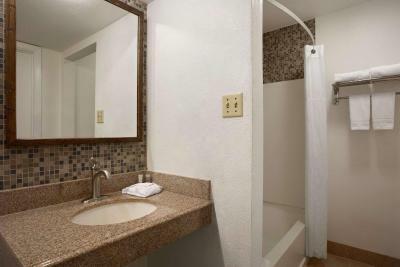 Plenty of parking, good access to highway and walking distance to Frank Erwin Centre. The location is the only reason we stay here. It is one block from my sons apartment and Franklin BBQ. One of our bestsellers in Austin! 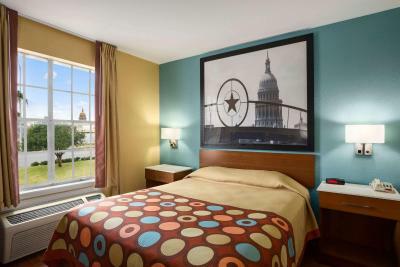 The University of Texas, the 6th street entertainment district, and the Frank Erwin Center are all within 10 minutes' walk of this Austin hotel. 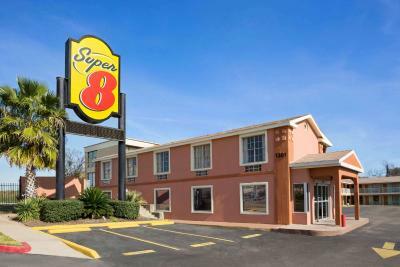 Located off Interstate 35, it features guest rooms with free Wi-Fi. 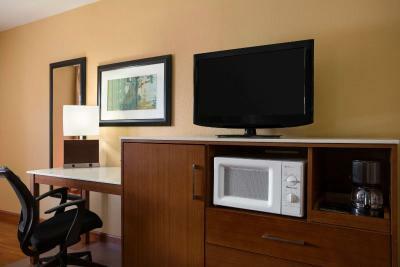 A microwave and fridge are standard in all rooms at the Super 8 by Wyndham Austin Downtown/Capitol Area. 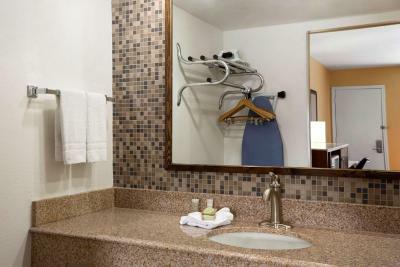 Each air-conditioned room is decorated in beige colours with warm accents. 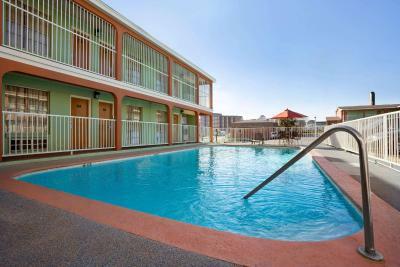 Super 8 by Wyndham Austin Downtown/Capitol Area offers an outdoor pool. 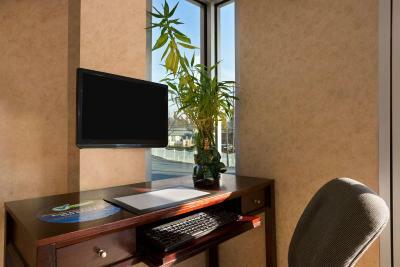 A business centre and 24-hour front desk are featured at this location. 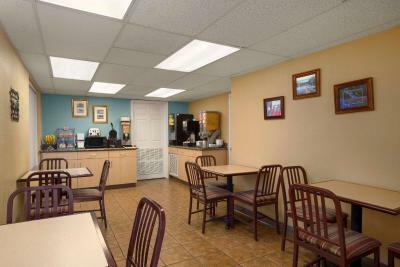 A free continental breakfast is served each morning. The Umlauf Sculpture Museum and the Morris Williams Golf Course are both within 3 miles of the hotel. The Austin Convention Center is 4 minutes' drive away. 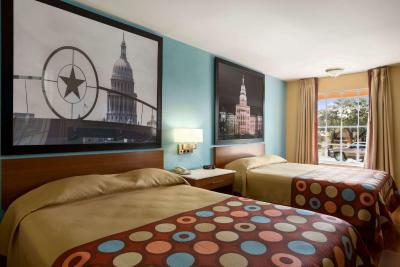 Super 8 by Wyndham Austin Downtown/Capitol Area has been welcoming Booking.com guests since 9 Mar 2012. 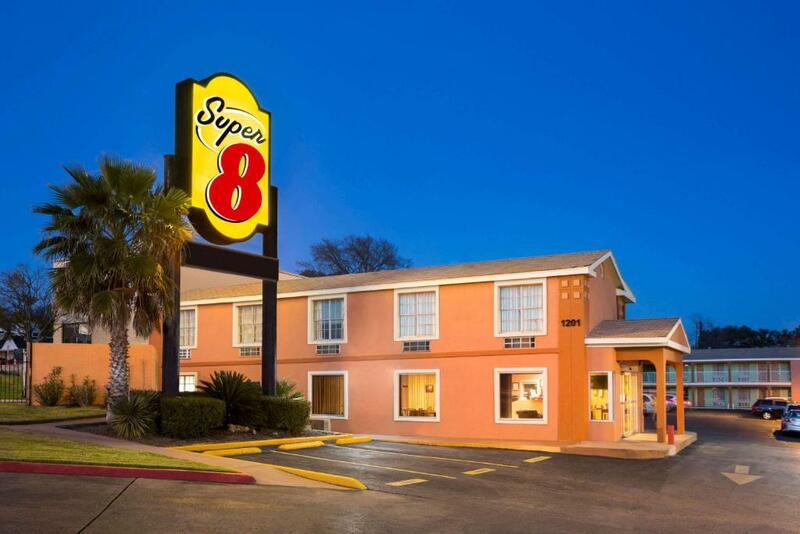 When would you like to stay at Super 8 by Wyndham Austin Downtown/Capitol Area? This room comes with free Wi-Fi and includes a microwave and a fridge. Cable TV is available. Ironing facilities and a hairdryer are provided. 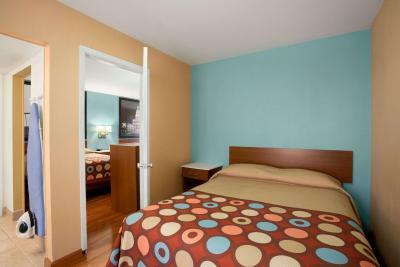 This air conditioned double room includes a cable TV, microwave and ironing facilities. 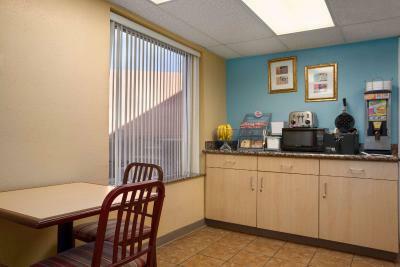 This air conditioned suite includes a seating area, cable TV, microwave and ironing facilities. 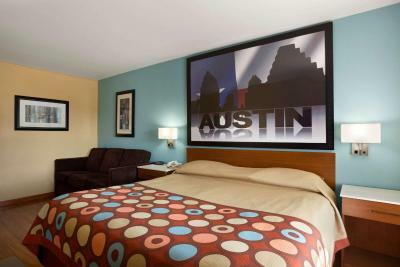 House rules Super 8 by Wyndham Austin Downtown/Capitol Area takes special requests - add in the next step! Super 8 by Wyndham Austin Downtown&#47;Capitol Area accepts these cards and reserves the right to temporarily hold an amount prior to arrival. Super 8 by Wyndham Austin Downtown/Capitol Area accepts these cards and reserves the right to temporarily hold an amount prior to arrival. Toilet rocked, some mold in the bathroom, motel style instead of hotel style, bed was too firm, fridge didn't really work, air conditioning was very loud, pool had broken glass around it and on the last day, it had trash in it. Farther from downtown than I expected- couldn't walk to it like I thought. The neighborhood, didn’t feel safe. The room didn’t feel clean. A little close to busy Highway 35, but at this price you cant have everything. A party was hosted next door. My phone didn't work and I feared coming out of the room and complaining. The staff must have known about it as it was so loud but they did nothing. That was from 3am to 6am. I slept awfully. The air con was like a car motor. There was no tagging system to take care of my luggage securely for a few hours whilst I wasnt checked in. Anyone could have taken it. The towel in the bathroom had blood on it. Blood! Most of it was fine but a few big hiccups described below. Not far to walk into the city. The hotel is next to the Interregional Hwy 35, so you could hear the traffic noise even in the late night or early morning. Not recommend to light sleepers. The bed was super hard . Toilet didn't flush properly. The AC was annoyingly loud. The pool was open but dirty, and what looked like a turd floating in it. There were just a few minor cosmetic appearances that could've been approved upon. Security lock missing, and toilet didn't flush properly. 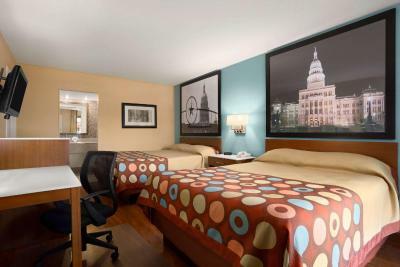 But other than that, my guest and I enjoyed our stay and loved how close it was to downtown! Location was perfect! Right next to downtown!! Sirens on the weekend there were nonstop. We could hear everyone congregating by the pool day and night. Just be ready for it to be loud and little done from the security. Room smelled like mildew and urine. The redone floors look as though they were flooded and dried and flooded again. For the price I should have stayed literally in dowtown not beside it in substandard facility. The location of the property was the attraction. The convience of getting to the highway arriving and departing was a plus. Short distance for food and beverages. Staff was friendly at check in and parking was plenty and well lit. Needs some upkeep. Breakfast is poor except for waffles.